Comments: Feather frond palm native to Lord Howe Island 375 miles east of Australia. 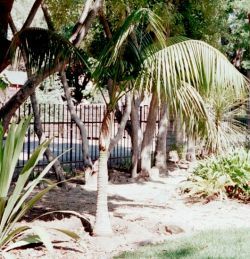 Drooping, dark green leaves over a smooth green to gray trunk. This tree is more commonly an indoor plant in our area--it can tolerate cool weather but not a freeze.